Announcing the Paint Your World Blue Sale from STA Travel, featuring last minute deals, including $100 off a Spring Break package and flights to Paris from $529. 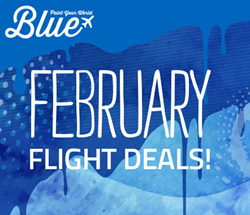 Beat those winter blues with the the Paint Your World Blue sale from STA Travel. Book by February 29, 2016 and recieve $100 off per person on a Spring Break package! Feeling those winter blues? STA Travel is pleased to announce the Paint Your World Blue sale, featuring last minute deals for the month of February. Crank up the heat this year with STA Travel’s Spring Break 2016 deals. Last minute packages start from $699, and until February 29, 2016 travelers are able to get an additional $100 off per person on a Spring Break package, bringing the price to only $599. These packages are selling fast and availability is limited, so call today for the guaranteed lowest Spring Break prices around. Terms and conditions apply. Book a G Adventures or Contiki tour of over $1000 or more and receive $100 flight credit to use on flights. As a bonus, this offer is combinable with other select tour promotions and discounts. Terms and conditions apply. Take a trip to the city of lights! Climb to the top of the Eiffel Tower, visit the Mona Lisa and stumble upon a plethora of Parisian cuisine. Big business, mega brands, state-of-the-art mobile phones, karaoke bars and hands-down the world's best sushi - welcome to Tokyo. From shopping in Oxford Street to grabbing a beer at a local pub, there's never a dull moment when visiting London. STA Travel is the leading student and youth travel agency enabling students and young adults to explore the world by creating experiences filled with adventure, discovery and personal growth. STA Travel offers a unique range of products with exclusive discounts on airfare, accommodations, tours, rail passes and more. Globally, STA Travel is present in 90 countries with 200 retail locations, sending more than 2 million travelers away each year.